Everyone has questions about mobile rock climbing. Below we have tried to answer the most common ones. Whether its a question about us, our equipment or how we would organise your event, many of the common answers are below. 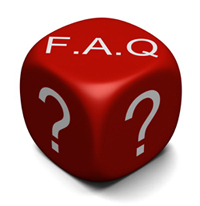 Please check below to see if your question has been answered below, if not feel free to contact us. How much space do I need for the mobile climbing wall? How many people can climb the mobile climbing wall at one time? Our climbing wall can cater for four climbers at one time. However, do not let this hold you back - we can cater for far more people than this! While we have four climbers on the rock climbing wall we get the next four climbers ready. Therefore as four climbers finish climbing, the next four will be ready to go straight into the activity. Who can climb the rock climbing wall? Our mobile rock climbing wall can be used by people between 3.5 stone and 18 stone and users must be able to adequately fit into a harness. Anyone under the influence of alcohol or drugs will not be permitted on our activities. Are you insured for the mobile climbing wall? Yes we are fully insured with £5million Public Liability insurance. Our mobile rock climbing wall is tested prior to operation and regular maintenance is carried out. We can also provide a risk assessment upon request. Will I require a power supply to operate the mobile climbing wall? No, the wall requires no external power supply, however when lighting is required for evening events, power is required if adequate lighting is not available on site. Our lighting and generator can be supplied at an additional cost. Appropriate clothing should be worn when climbing the wall. We recommend wearing comfortable casual clothing such as t-shirt, long trousers and flat comfortable shoes. Appropriate clothing and foot ware must be worn as climbers will not be permitted to climb the wall without them. What is an automatic belay? The auto belay automatically controls the rate of descent when a climber falls or chooses to descend from the wall. The function of the automated belaying system is to take up the slack in the climbing cable as the person climb. We have £5 million public liability insurance and we can provide risk assessments for all of our activities. We always provide friendly, fully trained, smart, uniformed, CRB checked staff to run our activities to ensure your day runs smoothly and safely. Are your inflatables made in the UK? All of our inflatable activities are manufactured in the UK by only the highest quality materials and workmanship. Unlike other companies, we do not import cheap, poorly made activities from China or other countries. Not only does this mean our activities are excellent quality, but it also means our activities have a far lower carbon footprint than others. How big are your inflatable activities? The specification for each inflatable activity, including their dimensions, are detailed on the individual page for each inflatable activity. If you have limited space or wish to discuss which activities may fit at your event, please fell free to contact us. Can I have a risk assessment for the activities? We can provide risk assessments for each of our activities upon request. We are also fully insured with £5 million public liability insurance. Can I use any of your activities indoors? All of our inflatable activities can be used indoors if you prefer. It is not possible to use the mobile rock climbing wall in an average hall as we need to drive the activity into position. We may be able to provide the mobile rock climbing wall indoors at facilities such as exhibition centres like Earls Court, Excel, The 02 Arena and National Exhibition Centre. Do you provide staff to run the activities? All of our activities are run for the duration of an event by trained operators. What ages can use your activities? The specification for each of our activities is given on each of the activity pages. If you require more information than this, please contact us to discuss your event. How many people can use each of your activities at one time? How do I book your activities? Please contact us by either phone or email and we will be happy to check our availability and send you the relevant booking information. Do you offer discount for hiring more than one activity? Yes, we can offer a multiple activity discount when hiring more than one activity together. Each event is always different, therefore we cannot give a generic price list. Please complete our enquiry form where we will be happy to discuss your requirements and give you the best possible price.